Pop's Cabin will be on the right approximately .7 miles up Skyline Road. 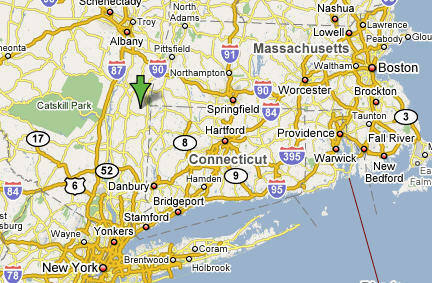 Take the MASS PIKE west to Exit 2, LEE, MA exit. Follow MA 102-W to Route 7. In Stockbridge, take a Left onto South St/US 7. In Great Barrington, Route 7 will come to a T intersection, take a left to stay on Route 7. After traveling through Great Barrington, take a right onto MA-23. Follow 23 past Catamount ski area into NY. Take a Left on Yonderview Road. Merge Left onto Route 22 South. In Ancramdale turn right onto Route 82 and follow up hill. Turn Left onto Skyline Road. At traffic light in Millerton proceed north on Rte 22 for .6 miles. Just past "Millerton Co-op" on right, turn left onto County Rte 60. Proceed up hill on Rte 60 for 1.7 miles and turn right onto Pulver Road. Proceed on Pulver Road for .7 miles and turn left onto County Rte 8. Proceed down hill for 3.5 miles to Stop sign in Ancramdale. Proceed straight through Stop sign onto Rte 82 (up hill) for approx. .75 mile. Turn left onto Skyline Rd.